"Campeur is a beautiful frameset. Its classic, French aesthetic is understated, subtle, and reliable. Handling is neutral both unloaded and loaded, which is the highest compliment for a touring bike. We built this frame up to remind audiences that you don't need through-axles, carbon forks, hydro-Di2, or even aero brakes to have a good time on your bike. There is beauty in simplicity." Looks pretty sweet. I'd choose shorter crankarms and bar end shifters if I were to ever get one, but based on appearance and description, that gets on my map. That's a fine build, but it needs lugs or fillet brazing to be considered "neo-classic." There's something about the way the racks are mounted that just doesn't look right. The front one seems really high, and looks tipped back, the back one is tipped forward... 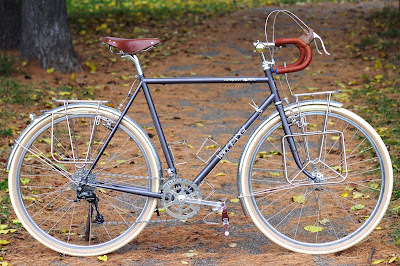 I'm sure it's functional, and I'm sure many of us would find it good enough, but it's the kind of thing I'd think Velo Orange would try to get right for the photo shoot. Very nice! I agree with @rhm's, @nlerner, and @bassogap observations. In addition, as much as the old style brake cable routing, I might like a aero approach better. I think this is an opportunity to address each of these issues. What about touring that argues for the old style brake cable routing? The sharp protrusion of the stem is a bit disconcerting. Lugs are the preference but I can understand the associated cost. There is no excuse for tilted racks! Either the design was off or the installation needs fine tuning. Crank length is personal preference. I appreciate mechanisms and so really like the brake calipers and associated cable hardware. I am a bit concerned with exposed springs. They will get dirty, either exposed or not. it might be easier to clean if they are exposed that letting the dirt and moisture be contained to invite corrosion. There is always that pesky dirt film that only comes off with physical contact. Guess that is what wax is for. ^ I agree. The first thing I noticed was how high the front rack was above the fender. What do you suppose a build like that would cost? I like what VO is trying to do, but I feel like their stuff falls in this "good enough" middle zone of not exactly inexpensive, but not exactly premium either. but I do have to admit that when I first saw the picture, I thought, "wow, I'd love to take that for a ride....what a beauty!" love the blue paint and white tires! I'm glad these are around. Black rear mech sticks out like a sore (sora?) thumb. Literally the only black thing on the bike, it appears. I would guess around $1200, buying everything new. Way too low. I just looked up the frame (on sale), crank, wheels and racks and got up to $1350. I'll bet it's over 2 grand all in. Seems to me this type of bicycle is getting more and more popular these days. Not necessarily a touring setup, but just a more utilitarian machine that's comfortable to ride. In addition, as much as the old style brake cable routing, I might like a aero approach better. Pretty sure the non-aero brakes are because its VO and they go retro as much as possible. You can pick up a Campeur frameset for the dirt cheap price of $450 right now and build it with aero brakes or even brifters- VO Campeur Frameset . The lack of lugs, like you mention, should be understood since it would change the cost significantly. That stem isn't my cup of tea, but like the brake levers, you could slap a threadless adapter on and put a beefy stem on it if you wanted(but why?). The racks are oddly angled, which is unfortunate. VO said in the comments section of the blog entry that it would cost around $2500. The frame and fork are currently $450, so you could build it up with good new modern components for $1100 or less. What they have on there is really higher than just utility components. That grandcru line of theirs looks great, but isn't cheap. It does look fantastic-- almost too pretty to take out and beat up on a real camping trip! I think you could easily build that up with decent stuff for under 1500 even with new stuff. I like that you can buy the fork separately for just $110. Sounds about right for a top of the line build. You could build up a Campeur frameset any way you want for around a grand less. That said, it shows old-fashioned retro has a beautiful elegance to it and for people who want a bike like the one pictured, it would be worth every penny to them. It's pretty, but a bit rich for my blood and I wish they'd leveled out the racks for an ad, but that's their choice. I like the other picture they post on the ad with bar ends much better. If nothing else, it's harder to see if the racks are level. Plus, if you're actually going to tour on it, bar ends just seem a more logical choice. Last edited by himespau; 11-19-15 at 11:41 AM. With non-aero brake cable routing you can more easily replace your cables and housing without having to retape your bars. If you're using leather tape (expensive), or shellacked cloth tape (durable) you don't have to worry about that added time and cost. I don't like the look of those stems either. To each their own. Why are lugs the preference? You can repair a tig welded steel bike easier than a lugged or fillet brazed bike. No matter the quality of the weld bead, it looks too "home construction" like to me. Lugs and even fillets are much nicer joint. As good as fillets look, I know the frame is not one tube. The next step is a hydroformed al or carbon frame with even more complex curves that make the frame look like one piece. The only joint option left that looks like craftsmanship is a lugged joint. No insult to any welders or those who craft quality fillets! JMHO. Oh and chrome those lugs or use polished SS! You can repair a tig welded steel bike easier than a lugged or fillet brazed bike. I can't believe how much nit picking is going on. Can't anyone just say " nice bike" without a comment? It isn't vintage. It is vintage inspired. VO, like Rivendell, are trying to capture the vintage look with modern performance.